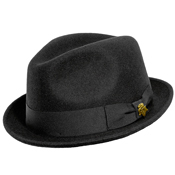 The Bigalli Milano wool felt fedora hat has both style, and quality. Coming in a variety of colors, you are sure to find the color that fits your needs! The brim measures approximately 2", and at the base of the 5" crown is a grosgrain band that matches the color of the hat. These 100% wool felt hats feature water repellent fabric, and a soft padded sweatband that will ensure your hat is comfortable to wear for a long time. Check out our Stingy Brim Milano Fedora!